blogopolis 2013 | Badudets Everything Nice! Last year’s Blogopolis was a success! This year, Nuffnang Blogopolis takes you to the information jungle. Key speakers will be discussing social media know-how and digital marketing and advertising trends. Blogopolis 2013 is a day-long event starting with plenary sessions in the afternoon, and a post-conference party at night where key influencers in the industry will be awarded. This event is open to everyone – bloggers, social media influencers, students, digital marketing officers, and advertisers, and anyone who is interested in the world of digital, particularly social media. 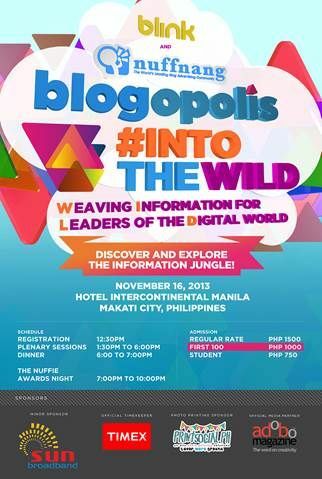 Blogopolis 2013 happens on November 16, 2013, Saturday, at Hotel Intercon in Makati. For tickets and more info, visit http://www.blogopolis.ph/.